Choose from the most affordable projectors ($80 to $600) for your home and commercial needs that will not burn a hole in your pocket, but still give you the best experience. There are times when the widescreen LED TV in your home or office conference room looks like you are still living in the 2010s. When technology is moving at such a faster pace where new inventions and gadgets are churned out monthly, it is necessary to stay update. 2018 has been good for the consumer electronics market so far, and getting a projector seems like an ideal time. It is at such a time that the top brands like BenQ and Epson have succeeded in packaging their best technology into something that is both cost-efficient and competent. If you are someone who likes to watch your movies on a bigger screen or go over business presentations with your clients on screens that are larger than what Samsung and LG can provide through their flat screens, stay glued on this article. Perhaps you want to magnify your gaming experience, or just simply want to go over your old photos; you should consider this article where we have listed our top picks of the best cheap projectors available in the market right now. We get it: buying a projector is not a mainstream thing, and many people do not consider it, as they are happy with their TVs or are contented with their existing home entertainment system. However, it would be surprising to know that the average cost of projectors has fallen drastically in the last few years, thanks to the aforementioned pioneers who launch newer models of their bestsellers almost every other year. The projectors are not only getting more efficient and cheaper but also breaking into the ecosystem of the home multimedia system. Watching a rerun of your favorite TV show (Breaking Bad, anyone?) in an LG 53’’ LED is nowadays so passé. Now is the time to go bigger, and now is the time to treat yourself with your own projector which will last for years and years to come and that which falls in your budget. Why Go for the Cheapest? This is one of the most relevant questions that must be asked when dealing with low-cost consumer electronics. Since HD beamers are not everyday devices like TVs and music systems, manufacturers have understood their position in the electronics ecosystem and have finally brought “the best” and “the cheapest” together. It makes more sense to purchase an inexpensive projector because most brands like BenQ and InFocus produce efficient projectors that now cost between $400 and $600 (compared to the range of $800 and $1000 in the previous decade). It just need to consider a product that has all the necessary factors checked, and which is capable of giving you what you need; larger picture. Projectors have now become smaller, less bulky, and power-efficient, and also give out a brighter picture and greater resolution. Besides, none of these factors are compromised when you go for affordable models because they are also some of the bestselling products of these brands. Pro Tip – The universal price range of projectors is $50 to $10000. A user should come to a budget based on this range. Anything below $600 is regarded as inexpensive, whereas those that go beyond $800 are considered reassuringly expensive. The six models that we have featured here pass most of the tests with flying colors. The only differentiating factor between them is the price, which ranges between $80 and $600. Pro Tip – The key to selecting the best projector is to keep a budget in mind before starting your research. If you have a figure in mind, narrowing down your choice and one that fits your budget will be easier. In addition to the popular companies such as Philips and Acer that you have heard of, one important thing to understand when selecting and buying a projector is that there are many more companies that are better at manufacturing projectors than those that diversify. Brands such as Optoma, Crenova, and Elephas specialize in such products, and it is crucial that one does not limit his/her approach to known brands when choosing the right model. This is one of the reasons why we have featured projectors manufactured by six different brands. Our selection of the six best cheap projectors is based on a variety of factors (listed later in this article), and we are positive that this guide will help you make a wise purchase. Note – Most of the featured projectors work on DLP (digital light processing) technology as it comes highly recommended over LCD (liquid crystal display). LED (light-emitting diode) projectors are comparatively expensive, long-lasting, and environmental-friendly, and do not suffer from the infamous rainbow effect. Optoma, the manufacturer of our top pick for the best cheap projectors, was founded in 2002 and has since expanded its operations to over 140 countries. The Taiwanese company’s first product was indeed a DLP projection television, and since then has created many market-bending products and ultimately winning numerous awards at electronics shows and contests for its groundbreaking technology. Although it is fairly ignored in the United States, it is one of the top projector makers in the world. Another Taiwanese corporation in this list is BenQ, which has been around 2001 and is known for its range of audiovisual equipment. BenQ focuses mostly on automobile applications, but that does not mean their projectors are anything less brilliant. Crenova and Elephas are both underdogs when compared with the bigwigs, but their projectors are absolutely stunning, giving better picture quality. Both companies manufacture some of the cheapest projectors in the world. Epson is a well-known name around the world and is something of a legend. The combination of Japanese technology and attractive heavy-duty design is a rare one, and World War II-era Company kills it with its exceptional range of projectors. ViewSonic, a homegrown US brand, completes our list with its WXGA projector, which is one of its kind and distinguishes itself from the other five with so many features. People who believe in “Make in America” should consider the VS model seriously. Pro Tip – Some other popular brands whose models made it to our long list are Erisan, InFocus, LG, Vivitek, and Acer. To make your purchase flow quicker and easier, it is crucial to consider several things such as purpose/use, technical parameters, and cost. While this article has inherently taken care of the cost, we just need to focus on the first two. This is the first question that you should answer before getting down to business. Generally, a projector is used to display a large picture through a playback system such as a laptop/computer or a Blu-ray player. It can be either for home use (as part of your multimedia home theater system) or commercial purposes (conference room, pubs). If you are building a home theater system and are looking to shun your TV when you are re-watching your favorite movies, it is better to concentrate more on the image quality and resolution than the audio output. Further, since picture quality will be the first parameter, you should also invest in a decent projector screen. Pro Tip – A projector with an integrated audio system is always a better investment than the one without. You never know when you will need a projector for an important application. 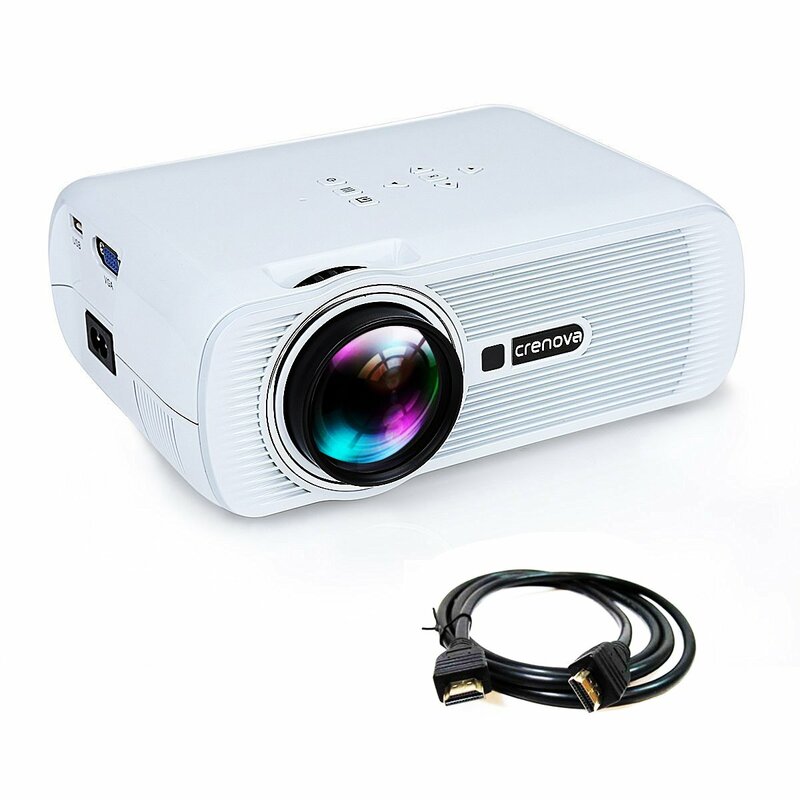 On the other hand, if you are buying a projector for business purposes, then you should focus on an all-in-one package which comes with more features such as dual HDMI ports, automatic standby, daylight mode, etc. Resolution – It is the degree of detail in an image. A projector’s main objective is to display a larger image, which can be made possible only by having a higher resolution i.e. 1080p. Anything less than that has no place in 2018. However, two models featured here do not support high resolution. Brightness – Measured in lumens, it is the amount of white light that is projected on the screen. The higher the better, and 1000 lumens is the bare minimum. Type – It is the technology on which a projector projects the moving image. There are three main types – DLP, LCD, and LED. While most models featured here run on DLP technology (uses tiny mirrors to reflect image), users should know that LCD (glass panels through which color images are passed) and LED (tiny diodes that emit light to form a complete image) are expensive, with the latter one considered the best. Input ports – All projectors nowadays use HDMI ports for interfacing purpose. While most models have to have one port, two is recommended for commercial uses. One or two USB ports are also supported. Integrated speakers – Ability to produce audio without needing an external sound system. An audio out port is an added plus as you can easily connect the projector to your audio system. Zoom – This is imperative as it defines the projecting capability of your model. The wider the zoom range, the better, as you can place it in all kinds of rooms – short, wide, long. Contrast Ratio – The difference between the black and white levels that a projector can deliver. The higher the ratio, the better the picture quality. If you are looking for lifelike viewing experience, pay extra attention to this number. Display size – This is directly proportional to the resolution, and denotes the size of the picture that a projector can create. 100 inches is the bare minimum. Color brightness/color quality/color light output – Simply put, it is the proper balance between white, red, and blue light. It should be directly compared with the brightness (lumens). This is sometimes known as color temperature. Secondary parameters like menu options, remote control, modes, power inputs, and support for 3D are very subjective. Hence, we recommend our readers to go over them carefully if they are significant. An upgraded version of the popular HD141X, this one here has better color quality and contrast ratio. With a maximum screen size of 107 inches, it is suitable for most types of rooms and settings. One of the company’s best-selling products on Amazon, the HD142X is known for its capability to project seamless 3D content and is the best cheap projector if you are into 3-dimensional movies. Its 2D capability is top-notch as well, projecting vibrant and crisp pictures. With full HD and 3D support, decent 3000 lumens for even daylight viewing, high contrast ratio of 23000:1, and 10W mono speaker, the Optoma HD142X is our top pick. Its backlit remote, MHL connectivity and audio out features give a wealth of experience, and total bang for your buck. Overall, the Optoma HD142X is one of the best cheapest 3D projectors that you can get for under $500, and add to that the 3D capability – it should be on the top of your mind if you see yourself watching Avatar 2 through Blu-ray disc in 2019. Pro Tip – It will be better to invest in a nice pair of 3D DLP glasses if you are into watching 3D movies. We recommend 3DHeaven’s shutter glasses for an ultimate experience. Many industry experts believe that the BenQ TH670 is the best cheap projector in the market right now. To be honest, we think the Optoma model above is the best, but if you are looking for 3D support AND immersive picture quality from one of the top projectors brands for under $500, the TH670 is going to be your best bet. BenQ markets itself as the #1 best-selling DLP projector brand worldwide, and we do not think it is an overstatement. It offers best of everything: color quality, integrated speakers, and 10000 hours of bulb life. Its precise balance of contrast ratio and color quality is what makes it a sweetheart among Amazon customers. Plus, the wireless presentation support by Qcast makes it the perfect choice for office and other commercial uses. What distinguishes this model from other candidates on this list is its automatic keystone correction that ensures you get the perfectly-shaped picture even when you tilt/move the projector. Although there are some minor issues with this model, long-term usability and the brand name nullify all of them. BenQ as a brand is known for its adaptive technology, which means its projectors have the ability to automatically adjust and project a picture on any given surface without compromising on the picture quality. Pro Tip – When setting up your projector, it is advised that you adopt trial-and-error method and NOT depend on configurations mentioned online, as a single setting would not ideally work for everyone. The key is to have a balance between darkness, clarity, focus, and temperature. and the best judge of this balance is you. Pro Tip – With the BenQ TH670, users may have to adjust the ambient lighting for a better experience. The BenQ TH670 is suitable for both residential and commercial purposes and is the best cheap projector that has additional features for under $500. Depending on BenQ’s cutting-edge technology will save you from frequent visits to the repairman. Pro Tip – We recommend you get a UPS (uninterrupted power supply) and a voltage regulator to protect your projector from voltage fluctuations. Having power backup also helps in extending the lifespan of your system. Note – This an LCD projector. Very portable; weighs less than half a pound. If budget is the the only parameter you are considering, let us introduce you the Elephas YG400 as the best cheap projector. It is easy to set up, lightweight, and power-efficient, making it one of the top models for users looking for projectors under $100. This model further boasts of excellent picture quality delivered through 1200 lumens and a contrast ratio of 1000:1. The maximum achievable resolution is 1080p, but stretching the model to its maximum gives out distorted picture. It is, thus, not recommended for business presentations. Additionally, its performance in daylight is comparatively worse. We understand that the ratings of this model are pretty low, compared to the Optoma and BenQ models, but Elephas is one of the pioneers of low-cost technology. Its products are affordable because of their light duty, and application-driven psychology. The Elephas YG400 is, thus, recommended for users who are looking for portability and rough use. The Elephas YG400 is the second cheapest projector on this list, retailing at around $80 on Amazon. If you are looking for a low-cost projector that satisfies your basic viewing needs, then this is the model to go for. You will not be disappointed! Pro Tip – You will need additional HDMI/MHL cables if you want to connect it to your Apple/Android devices. It is regarded as one of the best-selling projectors of all time. The Epson VS240 is an excellent entry-level model that takes care of almost everything – from clear, bright picture to accurate color coding. With 3000 lumens to brighten its picture and hybrid DLP-LCD combination, it was one of the most advanced projectors when it came out a few years ago. It comes with an intelligent sleep mode where you can switch off the display without turning off the system. The only major issue with this model is that it has an outdated SVGA video output that supports only 800×600 resolution. If you can ignore this single con, the Epson VS240 is going to be a wise purchase for long-time use. Epson is a known brand and has been around for years. If you have used any of its electronics products, you know that their models are reliable, economical, and easy to use. The VS240 is no different and is the perfect choice for a projector under $300. Pro Tip – If your projector runs on UHP (ultra-high performance) lamps, it will be a good idea to assume their replacement cost after 3-4 years of 4-hour daily usage. Look for greener options when replacing as they will be cost-effective in the long run. The thing with low-cost projectors is that they are not rated highly, but still give good picture quality and brightness. This Amazon #1 bestseller projector runs on LED technology and has 1000 lumens to brighten up its image. With a contrast ratio of 1000:1, square pixels output, 30000 hours of lamp life, and 3-year limited warranty, it is the second best cheap projector for under $100. A direct threat to our first pick – the Elephas YG400 – this Crenova model is frequently listed amongst the cheapest projectors that you can find for your residential use. Unfortunately, its low brightness and aspect ratio makes it unsuitable for office and presentation purposes. Many online reviewers recommend the XPE460 for gaming, and they are right. However, we have tested it for all applications, and it works well for home theater systems as well. We think the lack of integrated speakers is its biggest con, and request our readers to take this into consideration. Crenova manufactures good quality projectors, and it provides exceptional customer support. According to our in-house reviewers, Crenova knows its stuff well and has caused disruption in the low-cost projector market. Users looking for budget projectors which do not want to compromise on picture quality should make their choice between Crenova and Elephas. Pro Tip – When looking for projectors under $100, one thing to understand is that you cannot use them for commercial uses and you will need a dark room for better experience. ViewSonic is another popular brand in the projector market and manufactures some really fine models. Its PJD5555W is a rockstar DLP projector and can be found in numerous lists which talk about best cheap projectors. With 3300 lumens, it is the brightest model in this list and additionally boasts of a contrast ratio of 15000:1 and 3D support. The main issue with this model is that it supports only WXGA resolution of 1280×800, which is like using Internet Explorer to browse the internet on an Alienware notebook. The ViewSonic PJD5555W is a solid image projector which comes at a great price and delivers the high quality pictures. We highly recommend it. If you were not able to narrow down your selection to any of these six best cheap projectors, you can have a look at the following four, which completes out top ten list. These projectors have their own great distinguishing factors but just could not make it to our final shortlist due to cost and some other major issues. We hope that this brief guide will help you make your purchase easier and swifter. We have invested hours and hours of research work in determining the capabilities of these above-listed projectors, and we guarantee that these will provide you the best experience on a budget. We have covered all the main aspects that are essential to determine a projector’s real worth without basing the final verdict on just the price. Since we have only dealt with models that are in a specific range, our focus was on picture quality, resolution, and additional features. Every single pro and con was weighed to come to the conclusion. Lastly, if budget is your primary defining parameter, one of these six best cheap projectors should take care of all your projection needs. However, if you are looking for better performance, you can consider adding few hundred dollars and getting the best projector in the market. Keep following our posts for more information and reviews of consumer electronics equipment.